“ Oh, brothers, don’t stay away, . . .
Oh, the irony. As the widely acclaimed Fisk Jubilee Singers preached this message of welcome to thousands of concertgoers, yes, they themselves were met with respect and praise by audiences, but all too often they were also greeted with closed doors. Perhaps the greatest example of a mixed welcome occurred two years later during their visit to Washington, D.C. After they were turned out of numerous hotels in the nation’s capital, they wandered the city until midnight, when they managed to find lodging in private homes. A few days later, they were at the White House at the invitation of President Chester A. Arthur. The Singers brought the president to tears with a performance of “Steal Away to Jesus” and the Lord’s Prayer. “I have never in my life been so much moved,” said the president. Honestly, I am disgusted with such behavior. After the Emancipation Proclamation, the Civil War, and the Civil Rights Acts of 1866 and 1875, I would hope that African Americans would be treated with more respect and dignity. Instead I see a distinct laziness shown by the public. Before the war, slaves would entertain Southerners at the plantation house, performing for no money and being told where they could and couldn’t stay. After the war, freedmen would entertain Northerners at concert halls, performing for money and being told where they could and couldn’t stay. As a culture, we seem to deal best with small changes: from plantation houses to concert halls, from no money to admission prices. We say all we want, using overblown platitudes to demonstrate our support for a cause, but we do as little as we can, avoiding actions that put any kind of strain on our time, budgets, or attitudes, even if a small change on our part could change someone else’s life. Look to the examples of the people of Springfield, President Arthur, and the writers, and go even farther: back up your words with actions. Otherwise, you’re only a hypocrite. “THE JUBILEE SINGERS.” The Independent …Devoted to the Consideration of Politics, Social and Economic Tendencies, History, Literature, and the Arts (1848-1921) 24, no. 1215 (Mar 14, 1872): 4. http://search.proquest.com/docview/90171741?accountid=351. “THE JUBILEE SINGERS AND THE WASHINGTON LANDLORDS.” New York Evangelist (1830-1902) 53, no. 12 (Mar 23, 1882): 2. 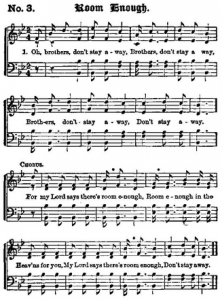 “THE JUBILEE SINGERS AT THE HOME AND TOMB OF LINCOLN.” Christian Union (1870-1893) 22, no. 8 (Aug 25, 1880): 156. http://search.proquest.com/docview/137032063?accountid=351. Marsh, J. B. T. The Story of the Jubilee Singers: With Their Songs. London: Hodder and Stoughton, 1876. Accessed February 23, 2015. https://archive.org/. “President Arthur and the Jubilee Singers.” Church’s Musical Visitor (1871-1883) 11, no. 6 (03, 1882): 162. http://search.proquest.com/docview/137466484?accountid=351.http://search.proquest.com/docview/125358571?accountid=351.